Let’s use the glow discharge in a flicker flame bulb to make some weird neon art. This video is a photographic tour and rebuild of a simple glowthing made from a novelty light bulb and an old CCFL backlight inverter. It might have left me with more questions than answers after the laser pointers came out. This entry was posted in Electronics Videos and tagged art, build, ccfl, diy, flicker flame, glow discharge, high-voltage, macro, neon on August 8, 2016 by Micah. The original machine did bug me in many ways when working on fine detail work. I’m lazy and uncoordinated with a needle, so I tend to sew almost everything by machine, even when the individual stitches all have to be lined up just right. In fact, when sewing the face parts on my meat and crab plushies, I found myself sewing individual stitches by turning the flywheel by hand. I don’t know whether more expensive sewing machines are any better, but on my cheap Singer Inspiration 4210 the stock motor is nearly unusable at slow speeds. It stalls easily, makes an awful buzzing noise, maintains an uneven speed, and delivers very little torque. My first experiments were to instrument the sewing machine with sensors that I could use to estimate the speed and angle of the main shaft. I needed some kind of absolute angle reference, plus some way of counting how far the shaft has traveled. For the angle reference, I found a really handy place to mount a photo-interrupter sensor. This cam is part of the mechanism that advances the machine’s feed dogs. It conveniently moves this metal bar back and forth once per revolution of the shaft. For sensing the shaft speed accurately, my preferred solution would have been a high-resolution encoder wheel attached to the motor or the main shaft. 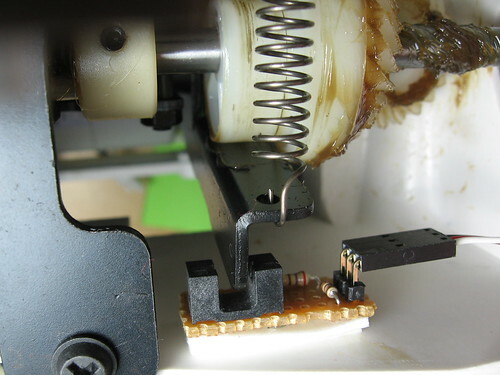 But that would, at the very least, involve making a rotary encoder disc and attaching it somehow to one of the sewing machine’s moving parts. I wanted to avoid messing with the machine’s moving parts as much as possible, so I looked for non-contact solutions. I noticed that, with a little signal conditioning, an IR reflection sensor works pretty well for counting teeth on the machine’s drive belt. After switching motors, I modified this to sense teeth on the motor’s sprocket instead, but the same signal conditioning circuit works in either case. The signal conditioner is an dual op-amp configured as an amplifier, bandpass filter, and comparator with hysteresis. 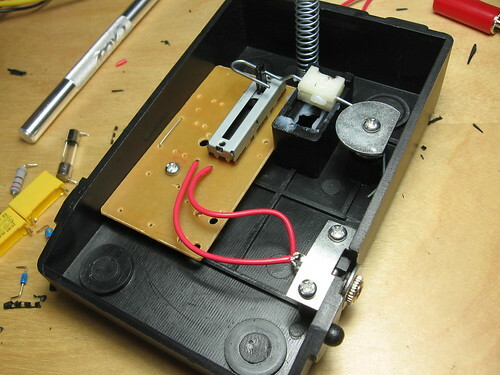 Lastly, there’s the most important sensor: the foot pedal! I wanted to keep the original foot pedal feel, but use it as a generic input device for the microcontroller. So, I removed all electronic parts other than the variable resistor itself, and connected that to a 1/8″ jack. With a little modification, the jack fit into the same hole that was originally used for the mains cord. I was experimenting with closed-loop servo control using this triac controller, but the results were pretty uninspiring. With a triac, you can only change speeds as fast as twice your AC power frequency. 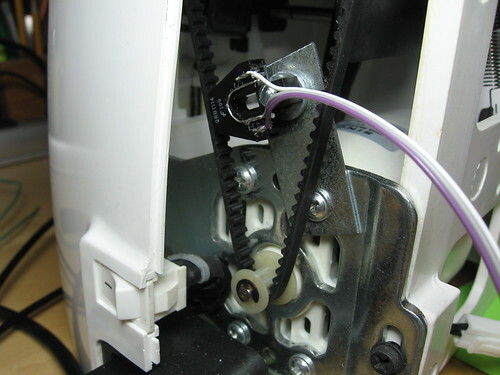 And a 120 Hz control loop just isn’t tight enough to keep the sewing machine operating smoothly at low speeds. The motor’s lousy torque at these speeds certainly doesn’t help. I also had lots of trouble with EMI in this design. With all the parts strewn about my desk and electrically isolated but not RF shielded, my microcontroller would randomly reset after the motor ran for a few seconds or so. I first saw this with my trusty Propeller. I tried switching to an AVR Butterfly, half to try and avoid the EMI, half to have its LCD and joystick as a user interface. But, no luck. Just use a DC motor instead of AC. This is more expensive, but it’s simple and until recently it was the only option. Variable-frequency drive. 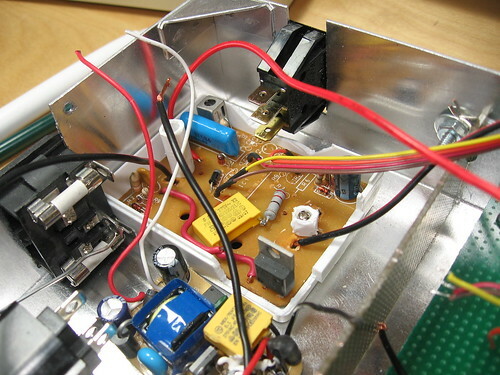 You still use an AC motor, but now you use an AC-to-DC power supply plus a DC-to-AC inverter to control the frequency of the motor’s power supply. With an induction motor, this controls the speed. So, I was about to settle for this mediocrity and finish off my triac-based controller with some buttons and mounting hardware from HSC, when I randomly happened upon the perfect DC motor. I didn’t know it was perfect at the time, but I had a hunch. As soon as I got it home and sat it next to the original motor, I knew. I was pretty lucky. The speed range was good, the sprocket had the same pitch, and it had plenty of torque at low speeds. The only problem: It’s just barely too large to fit inside the sewing machine cabinet. So, I had to improvise the mounting a bit. I ended up slicing off the bottom panel of the sewing machine, bolting its frame to some scrap pressboard, and mounting the motor using a hacky arrangement of pressboard scraps, screws, and zip ties. I started out building a simple MOSFET speed controller for the motor, since I’d never used a MOSFET to control an inductive load before. But after spending an hour or two trying to squash transients and convince my FETs to switch at a high enough frequency, I figured I’d had enough pain for one week. I had a spare LMD18200 chip with this project’s name on it. The LMD18200 is an amazingly versatile and robust little chip. I used it for my laser projector project a while back. It was really overkill for that, but it’s about right for this sewing machine’s beefy new motor. 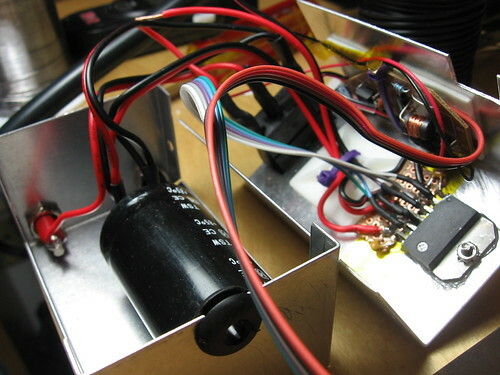 I needed a pretty heavy duty motor drive capacitor too, so I ended up mounting the LMD18200, capacitor, and DC-DC converter in a small metal box for safety reasons. If the capacitor fails, I’d prefer not to have burning hot electrolyte and shrapnel all over my face. I did leave plenty of room in this build for later expansion. I’d like to add some kind of user interface for switching sewing modes. Right now I’m using the USB port for that, but a little LCD with a rotary encoder knob would be just swell. 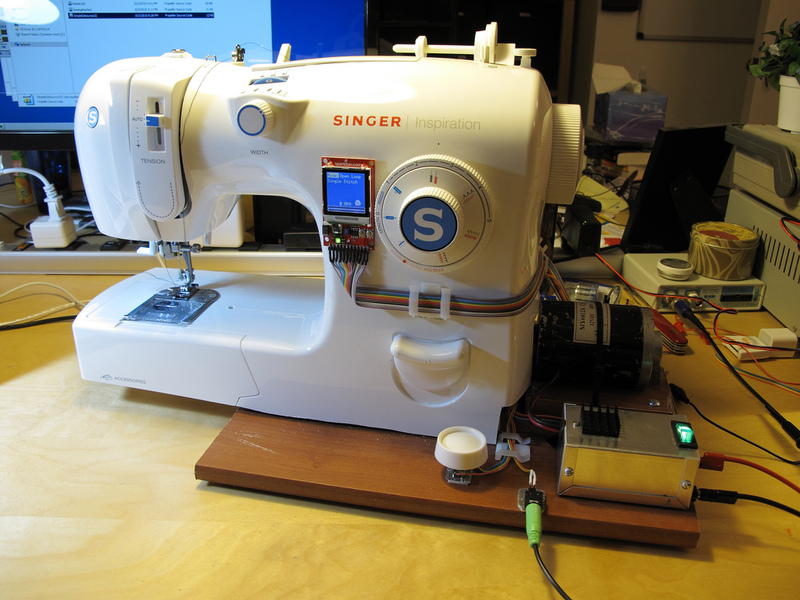 I’ve also thought of other ways to automate the sewing machine to make common tasks easier. For example, it would be useful to have a mode that automatically lifts the presser foot between stitches in single-stitch mode. I already found a good place to mount an RC servo motor for that. 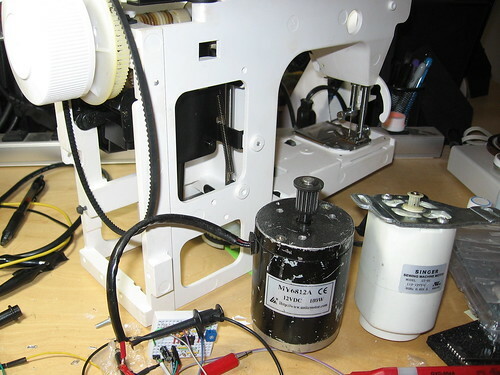 This entry was posted in Arts & Crafts, Portfolio, Propeller, Sewing Machine and tagged diy, hacks, motors, propeller, retrofit, sewing on January 21, 2010 by Micah.